We gebruiken cookies. Dit doen we om onze site persoonlijker en gebruiksvriendelijker te maken, onder andere door analyse van je bezoekersgedrag. Als je verder surft accepteer je onze cookies. Alvorens uw reactie geplaatst wordt, zal de redactie deze beoordelen. Rooster het sesamzaad in een droge koekenpan goudbruin en schud ze op een bord. Hak de ananasblokjes wat kleiner. Meng de ananasblokjes door de yoghurt. Schep de koriander erdoor. Schep de ananasdip in een schaaltje. Besprenkel met olijfolie en bestrooi met het geroosterde sesamzaad. Serveer met zoete-aardappelchips om te dippen. 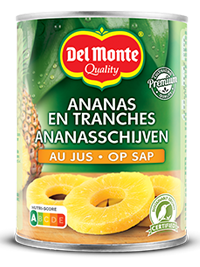 Tip: Ook rauwkost en puntjes geroosterde, volkoren pitabroodjes zijn heerlijk om te dippen in de frisse ananasdip. This policy helps to explain the occasions when and why cookies may be sent to you when you visit the websites of Del Monte International GmbH (referred to in this policy as "we", "us" or "our") and how you can block and/or delete cookies. "Cookies" are text-only pieces of information that a website transfers to an individual's hard drive or other website-browsing equipment for record-keeping purposes. Cookies allow the website to remember important information that will make your use of the site more convenient. A cookie will typically contain the name of the domain from which the cookie has come, the "lifetime" of the cookie, and a randomly generated unique number or other value. Like most websites, we use different categories of cookies for a variety of purposes in order to improve your online experience. Depending on the purpose, we use session cookies, which are temporary cookies that remain in the cookie file of your browser until you leave the site, and persistent cookies, which remain in the cookie file of your browser for much longer (though how long will depend on the lifetime of the specific cookie). What are the categories of cookies? 'Strictly necessary cookies’ let you move around the website and enable you to use features that you have specifically asked for, such as the Nutrition Calculator. Without these cookies these features would not function. Strictly necessary cookies tend to be session cookies which are deleted at the end of the browser session. 'Performance cookies’ collect information about how you use our website such as which pages you visit and if you experience any errors. These cookies don't collect any information that could identify you – all the information is collected on an anonymous aggregate basis and is only used to help us improve how our website works, understand what interests our users and measure the effectiveness of our advertising. They also enable us to track the total number of visitors to our site. Most performance cookies tend to be session cookies which are deleted at the end of the browser session. In some cases, some of these cookies are managed for us by third parties, but we don't allow the third party to use the cookies for any purpose other than those listed above. Some of these third party performance cookies are not session based and have varying expiry dates. If you prevent performance cookies we cannot use information from your visit to improve your future website. 'Functionality cookies’ are used to provide services or to remember your settings. This may include your user name if you have selected ‘remember me’ at a log in page. These cookies help to customise your experience. They also assist with the administration of certain other activities such as online prize promotions. We may associate personal information with a cookie file in those instances. Functionality cookies, by their very nature, are persistent cookies so that we remember your computer when you return to our website. Some of these cookies are managed for us by third parties – where this is the case we don't allow the third party to use the cookies for any purpose other than those listed above. If you prevent cookies, including functionality cookies, this may mean we can't offer you some services. Targeting cookies collect the most information about users. These cookies are used to deliver adverts more relevant to you and your interests. We shall not use a targeting cookie without your express consent, which we would usually obtain by asking you to register and/or opt in to a particular service. How can I block and/or delete cookies? Use the options in your web browser if you do not wish to receive a cookie or if you wish to set your browser to notify you when you receive a cookie. You can easily delete any cookies that have been installed in the cookie folder of your browser. Click to open Internet Explorer. On the General tab, under Browsing history, click Delete. for any other options you also want to delete. If you don't change any check boxes, deleting the browsing history removes temporary Internet files, webpage history, and cookies. Temporary files and cookies for your saved favourite websites are preserved. If you are not using Microsoft Windows Explorer, then you should select "cookies" in the "Help" function of your browser for information on where to find your cookie folder. If you disable all cookies you may not be able to take advantage of all the features of this website and some webpages make not work correctly.